Rediff.com » News » Will Russia sell Sukhoi-35 fighter jets to Pakistan? 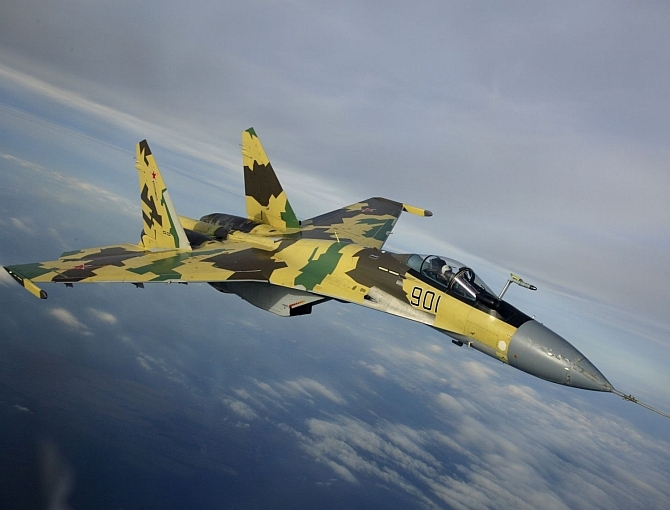 Will Russia sell Sukhoi-35 fighter jets to Pakistan? Pakistan is negotiating with Russia on acquiring an unspecified number of Su-35 'Flanker-E' multi-role fighter aircraft in potentially the largest military deal between the two Cold War-era adversaries, according to a leading defence weekly. Pakistan Air Force has discussed buying Sukhoi-35 'Flanker-E' fighter aircraft from Russia in potentially the largest defence deal between the two countries, but a final decision is yet to be made, IHS Jane's quoted a senior Pakistani government official as saying. The official was responding to Russian media reports that Russian Deputy Foreign Minister Sergei Ryabkov had said talks were underway for an unspecified number of Su-35s, which follow a recent agreement to provide Mi-35M 'Hind E' attack helicopters to Pakistan. While the official said "it's too early to say if a deal will conclude and the terms", the fact that discussions have taken place shows Russia's willingness to sell advanced hardware with Pakistan despite Moscow's longstanding ties with India. The official said Pakistan's interest in the Su-35 was driven by the PAF's need for a twin-engine fighter "that can fly for a longer range than the JF-17 and penetrate more deeply into the enemy's territory". The PAF currently flies a mixed fleet of Lockheed Martin F-16s, Dassault Mirage-5s, Chinese-manufactured F-7s, and the JF-17 Thunder, which is jointly produced by China and Pakistan. Islamabad is eager to improve its ties with Moscow to diversify its military options in the event of any stalemate in ties with Washington, Pakistani media reported. The Mi-35M chopper deal was signed during the visit of army chief General Raheel Sharif to Russia in June when he met top defence officials. The two countries last year signed a military cooperation agreement to deepen their defence ties and vowed to translate their relationship in "tangible" terms during Russian Defence Minister Sergei Shoigu's visit to Islamabad. Shoigu was the first Russian defence minister to visit Pakistan in 45 years.